During New York Fashion Week, long skirts/maxi skirts were adorned and constantly repeated on the runway in various collections. 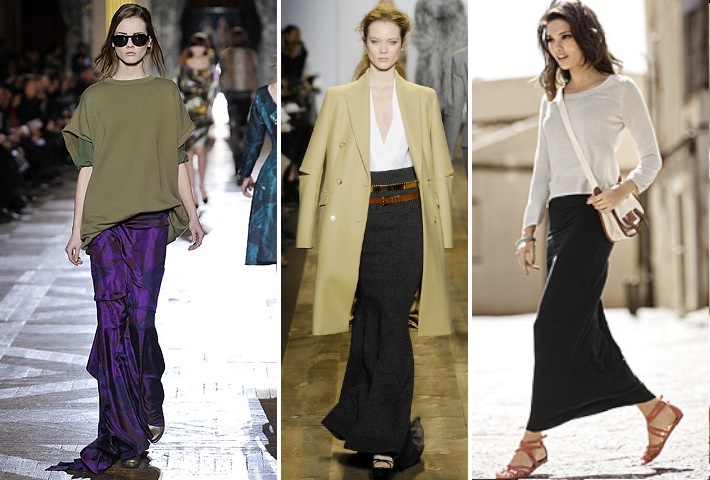 Jason Wu, Emilio Pucci, Richard Chai, Diane Von Furstenberg, Michael Kors, Vena Cava and Isaac Mizrahi are just a few designers that represented maxi skirts in their Fall 2011 collection. This reinvention of the maxi skirt is conservative, comfortable and simple but still super hot and trendy! In the fashion world, styles always come and go. This year, it’s time to turn heads with the come-back of styles from the past, and the maxi skirt is just uttering the beginning. So on a personal note, I was approached by Beso.com, an emerging fashion and lifestyle website! I was quite pleasantly surprised at how easy it was to come across several cute maxi skirts, all conveniently placed on one website. I was able to find my favorite maxi skirt within just 5 minutes! =O. This website is definitely worth checking out for your next shopping endeavor! 1. Simplicity is key: Because maxi skirts denote simplicity and comfort, stick to this look by pairing the maxi skirt with a simple and comfortable top. This creates a casual and effortless look while unifying a balance of style. Wearing a solid colored top in a different color than the maxi skirt works great, because it also creates a color-block interest. 2. Cotton it up: This is the skirt you want to wear a cotton tee with. It all goes back to casual comfort. What’s more comfortable than a plain cotton tee? …….. exactly, nothing! The majority of maxi skirts are made of jersey cotton, pima/modal or rayon. Support this fabrication choice by wearing a top in a similar fabric. It’ll further help identify the casual look of a maxi skirt. 3. Tuck it in: Tuck in your shirt to help identify your waist line. Sometimes a waistline can get easily lost in translation when wearing a long skirt. Avoid this missing hipline by tucking in your shirt. Feel free to accentuate your waistline by using a belt (like me). In addition, because a maxi skirt is also very long in length, tucking in your shirt also helps break up components, identifying where the maxi skirt begins. 1. Geri Hirsch wearing a black jersey skirt, and a turband! 2. Hanneli wearing a green maxi skirt, belted and with a white jersey shirt. you look great! i love the outfit. loovely maxi skirt, and gorgeous shoes! TO DIE FOR! <3 ALWAYS SO CHIC! and I love your wedges. Love the maxi skirt, but could never pull it off!! You look great! Great post! I love maxi skirts just got myself a new one! absolutely LOVE this! LOVE your blog! check mine out!any advice or comments would be amazing! Wow loving the shoes – gorgeous! Your blog is so trendy! !